2. Cut squash in half lengthwise and remove the seeds. Cut crosswise into 1/4-inch thick slices. Set aside. 3. In medium skillet, cook bacon until brown and crisp. Drain on a paper towel-lined plate. Remove all but 1 tablespoon of the fat. Sauté the onion over medium-high heat in the bacon fat until the onions are soft but not brown, 5 to 7 minutes. Add sage and thyme and mix well. 4. Butter an 8 x 8-inch baking dish. Distribute half the squash slices in the dish. Sprinkle with half of the sage, thyme, salt and pepper. Arrange half of the onions and half of the bacon over the squash. Repeat. Top with Swiss cheese. Pour the cream around the edges of the gratin. Cover loosely with foil and bake for 35 minutes. Remove the foil and add the Parmesan cheese. Top with breadcrumbs. 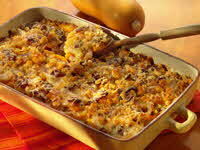 Turn oven down to 375°F and bake uncovered 15 to 20 minutes, or until cheeses and breadcrumbs are golden brown. Transfer to a cooling rack and stand for 15 minutes before serving. Sargento Artisan Blends features a delicious mingling of high quality Sargento cheese with flavorful, handcrafted artisan cheese. The artisan cheeses hail from artisans all selected in recognition of their own passion and commitment to the highest flavor standards. Six shredded varieties include Parmesan, Parmesan & Romano, Whole Milk Mozzarella, Whole Milk Mozzarella & Provolone, Double Cheddar, and Swiss Blend.